Our very last book from the batch that Lark Publishing sent me to give away this month! The book that is up for grabs this week is The Weekend Crafter: Beading: 20 Great Weekend Projects, a re-released volume that contains a good beginner section on materials, tools, and techniques, as well as some fun projects that can mostly be completed in one weekend. The projects are divided into jewelry/accessories and home decor. Please make sure that your link will lead me to an email address, or else I won't be able to contact you. No contact, no win, and I simply have to go on to the next person. Deadline: October 6, 2011. Once you've mastered the basics of design and technique, it's usually pretty natural to want to move on and start creating really show-stopping one-of-a-kind pieces of jewelry. This doesn't mean that if you start out as a bead stringer that you must necessarily move on to bead weaving or some other "more difficult" technique. Rather, what I'm getting at is that eventually you will probably want to start doing something that really sets your jewelry apart from the thousands of other people who are making jewelry. So how do you do that? One obvious way is to create your own findings and components, make your own beads, charms, or pendants, or to develop some other sort of twist that you become known for. There are so many different ways to add value to your work that I began to collect some posts written by artists who are much much smarter than I am when it comes to this topic. This week's Tuesday Tangle is about experimentation and trying new designs. Melanie gets ready to join up in the Etsy Boot Camp and is looking for more recruits! 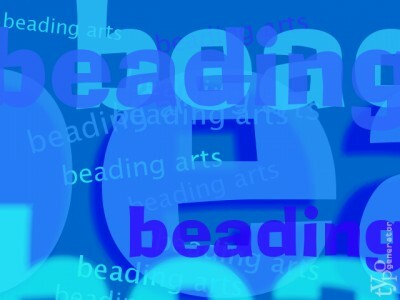 Jean reviews Jamie Cloud Eakin's fabulous new bead embroidery technique book, coming out in early October! And posts a Blythe doll photo, of course. Love miniatures? Charlene takes miniature book components, paper, ribbon and a few beads and makes a mini book necklace. You can too! 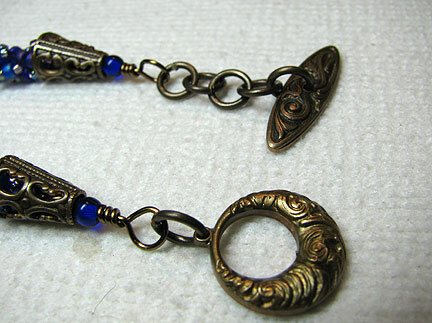 Have you ever made a zipper pull to match a pair of earrings? Check out this first attempt! 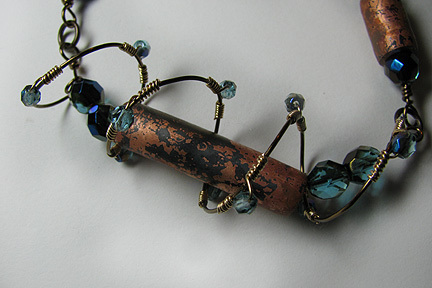 Jazz up your eyes with this beaded eye glass chain tutorial. Shannon shares some tricks of the trade regarding jewelry metal punches. 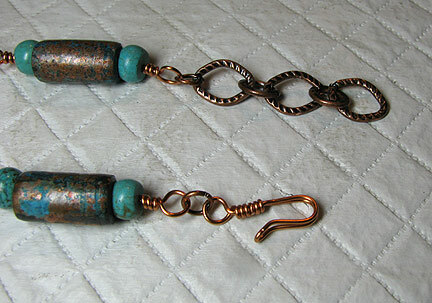 Last week, I shared my process for creating these ammonia and salt patina copper beads. This week, I want to show you the piece that I made with them! 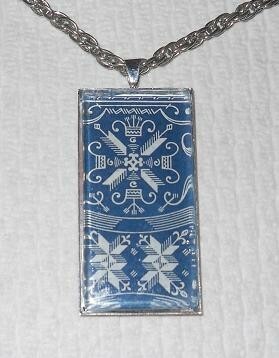 Here is another necklace that used these beads, and you can find the information on it in this post. 1. Design two or more types of links that will alternate in your necklace. 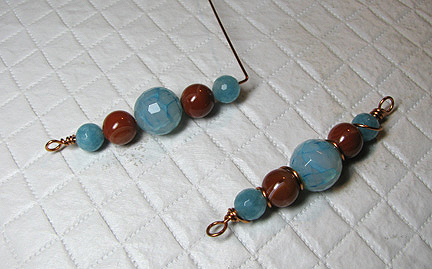 I made copper wire-wrapped links from the fire agates and bulleye agates, and copper tube links with turquoise disks. 2. 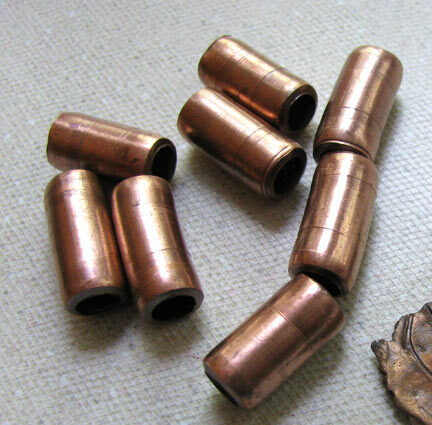 Turn a wrapped loop on one end of your copper wire. 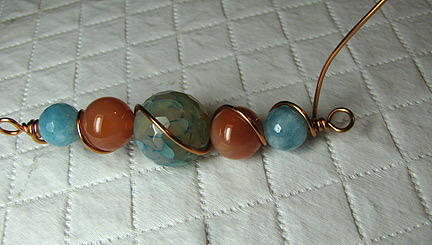 You will have to have to figure out the length of wire needed for this style link with a little bit of trial and error. I ended up needing 7 1/2 inches of wire on the second end in order to form the second wrapped loop, wrap it back around all the beads in the link, and anchor it on the original end. Make as many of these links as you desire. I made five. 3. For the shorter tube bead links, it should be a bit easier to figure out how much wire is needed. 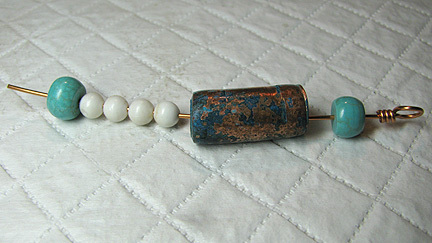 Turn a wrapped loop and slide on a turquoise disk, the copper tube bead, small plastic beads to fill the tube, and a second turquoise disk. The plastic beads will keep the tube bead centered on the wire and prevent it from coming out of alignment with the disks. 4. Turn the second wrapped loop on the other end. Make as many of these links as you desire. I made six. 5. Connect all the links with jump rings. 6. 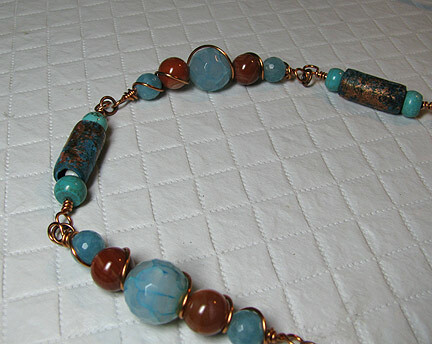 Use jump rings to attach a few links of copper chain and a hook or clasp to the ends of the necklace. 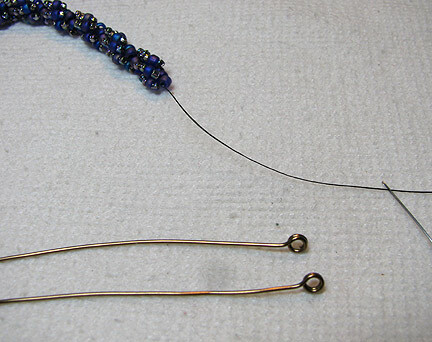 Instead of using a commercial clasp, I used about 5 inches of wire to fashion a simple hook. 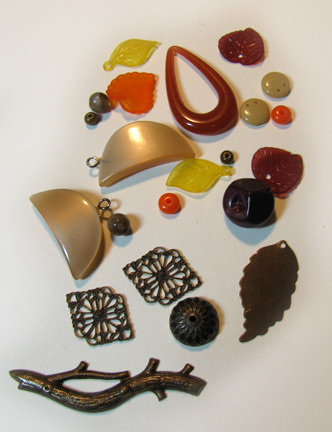 Carmi has links to a mosaics in resin series to share this week. Melanie ponders if her new cat pendant design is seasonally spooky or a year round treat. I love B'Sue Boutiques and Brenda Sue is having a blog hop in October! Come read about it! 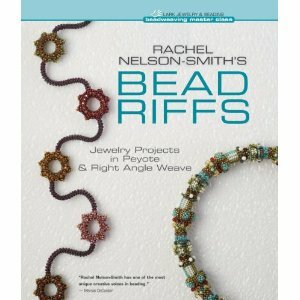 Charlene reviews a book that blends beading and jazz - Bead Riffs. If you were wondering about the best method for adhering flatback swarovski crystals to a rubbery textured object, Lisa's discovered the answer! Superglue! Check out her newly crystallized slap-watch. 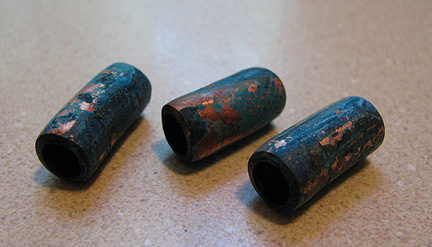 Tammy discusses and provides a tutorial about the dirty side of metal jewelry. Honeysuckle hangs on! No big surprise there...this lovely color that was designated the "Color of the Year" by Pantone is joined by some other beauties that you don't always associate with autumn. I'm pretty happy about it, because even though I love autumn leaf colors, it does get just a bit predictable. So, decide whether or not you care what the popular colors are, whether or not you intend to follow the trends. As for me, I love them this season, so I may as well enjoy them! 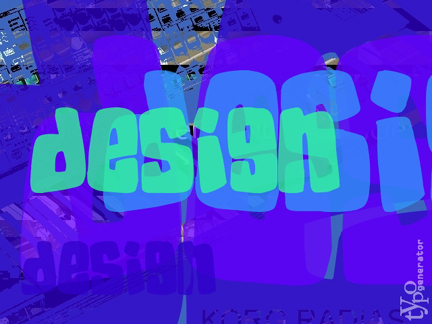 More information on the Fall 2011 color palette is available at the link above. Want to know what trends are predicted for the new season for jewelry styles? Check out Fashion Trendsetter...so far the predictions are classic, straight lines with geometric forms, retro rocker, and nature inspired designs. More intriguing to me is the prediction of jewelry pieces that have interchangeable elements to allow for more personalized design choices. Are any of you familiar with tambour beading? I've never tried this form of bead embroidery, and it looks kind of wicked cool. What do you think? But wait, there's more! I wanted to play around with more patinas, and this is what I came up with: an easy way to create an ammonia and salt patina. Please be careful when you do this! Ammonia has wicked nasty fumes, so please take precautions and make sure you have good ventilation, or even better, do it outside! 1. 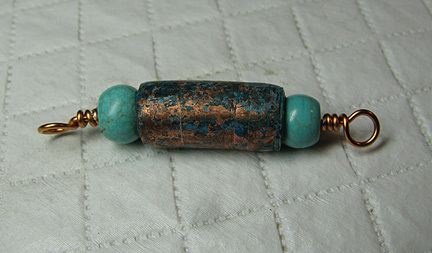 Take a look at my earlier tutorial that covers how to cut copper tubing to make beads. Make as many beads as you'd like but don't proceed to the LOS patination step. 2. 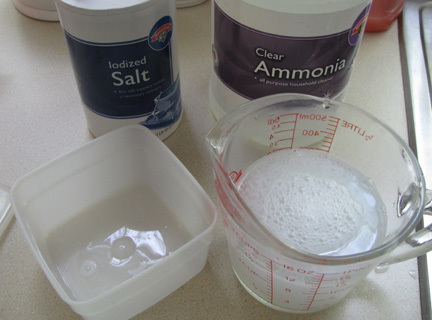 Mix up some ammonia and salt in a bit of warm water, and pour it into a small lidded container. How much of each? I don't really know. I just added a large splash of ammonia and sprinkled some salt in. 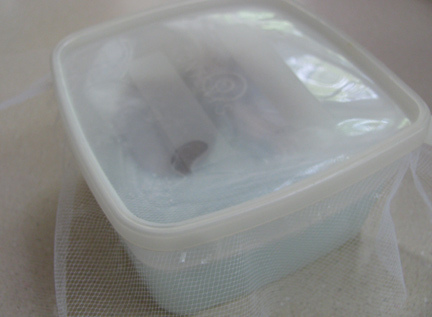 Using a piece of packing tape, attach a piece of netting fabric to the outside of the container near the top. 3. Place the beads to be patinated on the fabric and dip it down into the ammonia solution. Stretch the fabric over top of the liquid so that the liquid is about 1/2 inch below the fabric, and tape the fabric to the oppsite side of the container on the outside. Sprinkle the beads with more salt and snap on the lid. 4. 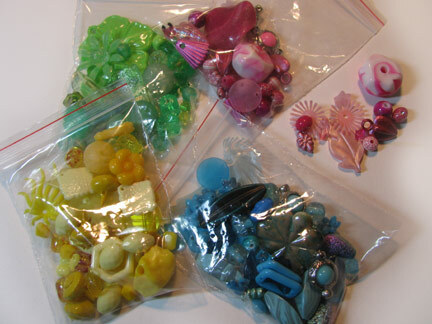 Allow the beads to enjoy the fumes for as long as it takes to reach the depth of color you want. Part two will be posted next Monday, when I'll share the instructions for a completed necklace! I have a series of pamphlets and books to give away this month, courtesy of Lark Publishing! Each of the pamphlets has 19 or 20 projects by a variety of artists, most but not all of them fairly easy and quick. 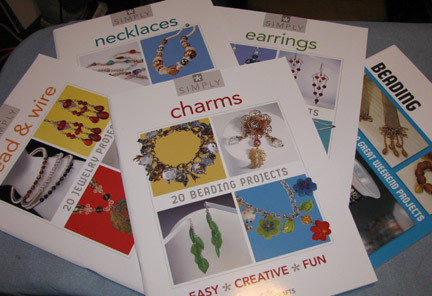 The second one up for grabs is Simply Necklaces, a pamphlet containing 23 projects that were previously published in Bead Love. 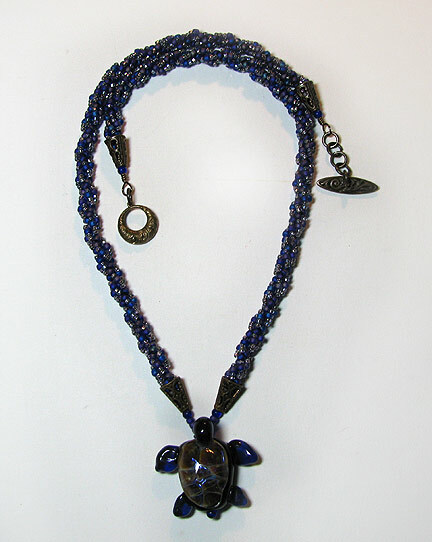 This volume contains pieces that are strung, bead woven, knotted, and chain with beaded links. Please make sure that your link will lead me to an email address, or else I won't be able to contact you. No contact, no win, and I simply have to go on to the next person. Deadline: September 15, 2011. Commissions - like my work enough to hire me? 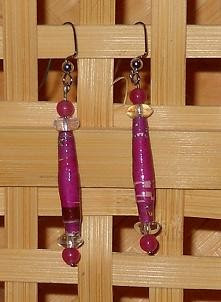 I specialize in making pieces that use beads or other items that are meaningful to you. 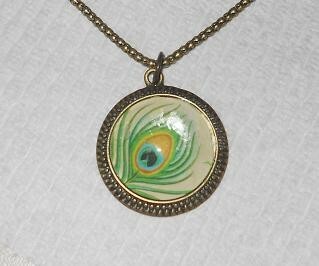 Marta uses repurposed paper and fabric to make beads that she then turns into gorgeous, custom jewelry pieces. An eco-friendly way to wear stylish pieces. She was cleaning out all of her sewing fabric one day when the madness began! 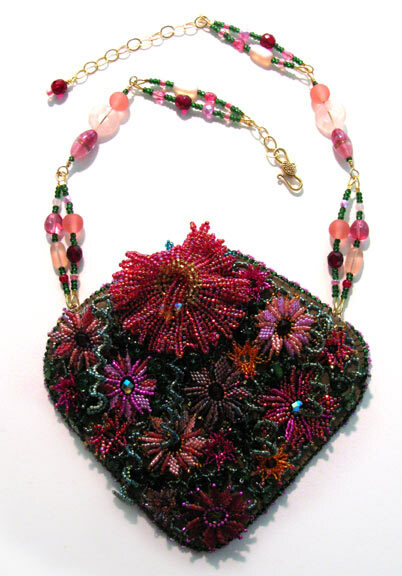 She tries to use repurposed fabrics for all sewing projects and actually create beads from repurposed paper to design all sorts of beautiful jewelry – necklaces, bracelets, earrings, pins, and hairpieces. 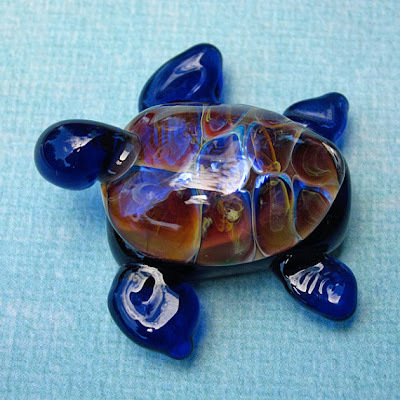 When my friend Maggie Towne added this adorable lampwork glass turtle to her etsy shop Bead Towne, I knew that she was going to be mine! Then came the inevitable problem: how do you feature a special bead without overwhelming it? 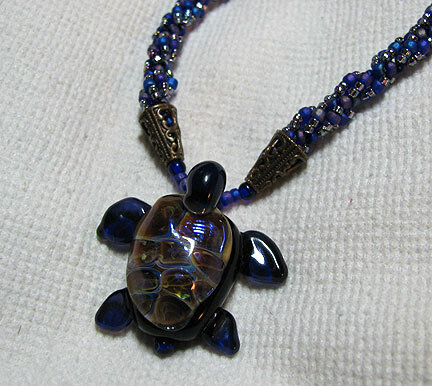 I decided that a simple spiral bead rope, using the colors found in Perth the Turtle was the way to go. Do you have other suggestions for what I could have done? 1. 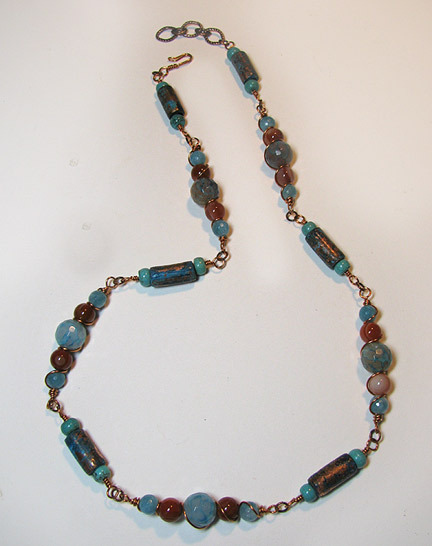 Create two beaded spiral stitch strands as long as you want the sides of your necklace to be. I used size 8/0 seed beads for the core beads and for one of the beads that create the spiral. I used size 11/0 seed beads for the rest of the spiraling parts. 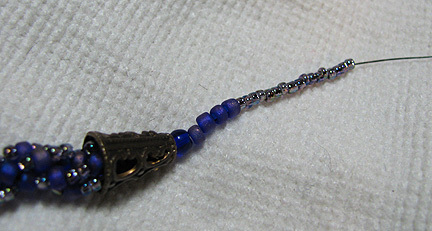 Using different sized beads like this gives you a subtle wave pattern to the strands. 2. 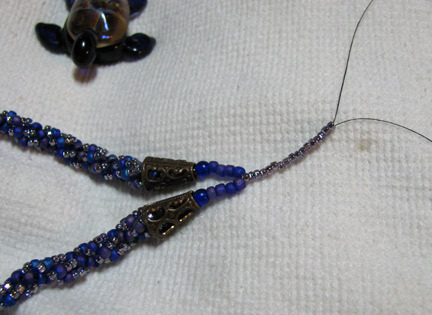 Take one thread tail from each strand down through a few extra beads, a metal cone, a 4mm round, and several more size 8/0 beads to where you want the top of your pendant to hang. 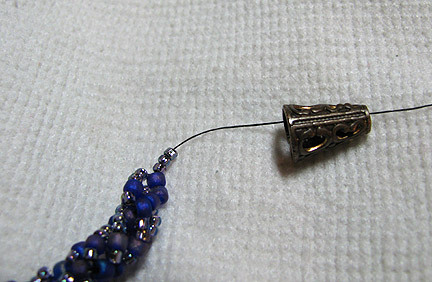 Use smaller beads to fill the hole of the pendant so it hangs straight and to protect the threads from rubbing on the larger bead and fraying. 3. Slide on the pendant and go through another 4mm round, taking the needles back up through the pendant. Anchor and tie the threads, burying the ends. 4. Cut 2 pieces of wire, each about 3 inches long. Turn a small double loop at one end. 5. Stitch the free ends of the spiral strands to these loops. Use a dab of glue on the knots and slide another cone on each wire, hiding the small loops. 6. Add another 4mm round to the wire and turn a wrapped loop. Add jump rings and your toggle set to finish off the necklace. Melanie unloads a kiln fill of new black and white deigns. I have a series of pamphlets and books to give away this month, courtesy of Lark Publishing! Each of the pamphlets has 19 or 20 projects by a variety of artists, most but not all of them fairly easy and quick. 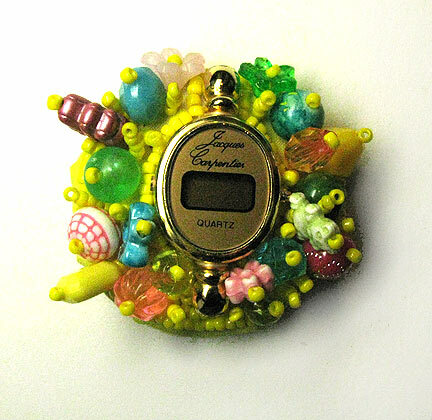 The first one up for grabs is Simply Bead & Wire, a pamphlet containing 23 projects that were previously published in Contemporary Bead & Wire Jewelry. This volume is probably best for those with some previous wire experience, and it covers earrings, rings, bracelets, necklaces, and broaches. Please make sure that your link will lead me to an email address, or else I won't be able to contact you. No contact, no win, and I simply have to go on to the next person. Deadline: September 8, 2011.